Heritage Lottery money could help return a listed church to its medieval splendour. Restoration work to remove two layers of concrete render from the 12th century All Saints Church, in Church Hill, Patcham, has taken four years so far. A successful £100,000 bid from the Heritage Lottery Fund covers almost a third of the £350,000 that the whole project is expected to cost. Before it can go further, the church needs to have planning permission from Brighton and Hove City Council. Ridding the church of the Victorian render is essential for the repair and restoration of the grade II* listed building, according to its planning application, as the render is cracking and creating damp patches inside the building. An area on the south side of the 14th century chancel is in particularly poor condition with wet plaster and a hole in the wall. Three years ago ‘windows’ cut into the thick render showed the original Sussex flint walls with different patches receiving a variety of treatments with lime mortar to protect the building and return it to its traditional style. Water cannot escape from the walls, as the cement render does not let the walls ‘breath’ as a lime render would, according to the report sent in as part of the planning application. This could cause problems for historic memorials in the building, such as a 16th century chalk monument to Richard Shelley. The church also has a 13th century painting of the Last Judgment, uncovered under layers of whitewash and limewash in 1879, after it was covered during the Reformation. Stone quoins – or corner stones – are visible in places, from both the 12th and 13th century, and are in relatively good condition to be restored. Church warden Sue Ward hopes the rest of the money can be raised through a friends organisation and crowdfunding. The parish wants to open the church more often and currently hosts a variety of events including former Brighton and Hove Albion manager Alan Mullery in conversation during the Fringe. Once the fabric of the building is in a better condition, future plans include creating a second exit and introducing more comfortable seating. 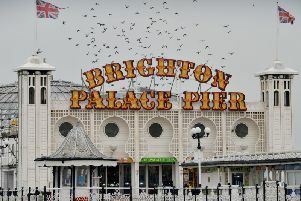 Details of the plans can be seen on Brighton and Hove City Council’s website at planningapps.brighton-hove.gov.uk by searching for application number BH2019/00847.